With nearby RSPB Nature and Bird Reserves for walking and bird watching. It is within walking distance of the promenade, pier, Blue Flag sandy beach and one of the country's most famous RNLI lifeboat stations. Places of historical interest nearby include NT Felbrigg and Blickling Halls. 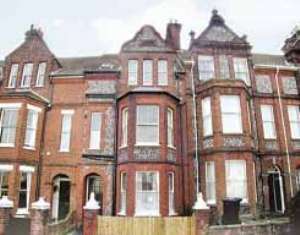 The train station, for visiting the nearby coastal resort of Sheringham and fine city of Norwich, is nearby. Norfolk Broads within touring distance. Shops, pubs and restaurants on the doorstep. Second floor apartment: Lounge, dining room/kitchen, 1 double bedroom, bathroom with shower over bath, toilet & basin. Services: GFCH. All gas (April-Aug), power, bed linen (duvets) & towels inc. Gas 20pw (Sept-Mar) poa. Parking for 1 car. DVD player. Radio/CD player. Elec hob & oven. D/washer. F/freezer. M/wave. Washer/dryer. Unsuitable for infirm & children due to stairs to apartment. Non smokers only. Friday to Friday bookings.